Fraternal Order of Moai - Why do Moai wear a blue fez? Why do Moai wear a blue fez? We get a lot of questions about the fez since it is a distinctive piece of headgear that stands out in any crowd. Let's cover the two most common questions and then look at the history of the fez. Yes, it is fun to wear one! No, you cannot buy one, sorry. From the earliest days of the Order there was discussion of a distinctive piece of clothing or headgear that would identify Fellow Moai but before long the decision was made to reserve the fez for higher ranks and create other symbols and attire to be worn by all Fellow Moai. 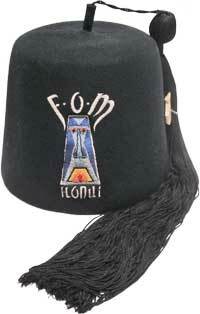 Only certain Moai are called upon to wear the blue fez of the F.O.M. They are Honui Moai and they are honored to be entrusted with the care of a fez, which is the property of the Order. It is kapu, forbidden, for anyone else to wear the fez. That's about all we can say about that as only the Honui may know the ways of the Honui and we have already said too much. The fez itself is real and is made to exacting specifications by D. Turin & Company in a classic navy blue. The Fellow Moai selected blue for the fez and our crest for a number of reasons. First, it stands out among the more common red fezes. Second, a lot of modern tiki artists use a blue jazz club style color scheme which makes the long stoic features of the moai look good in a sophisticated way. Third, blue is cool, and of all the tikis, the moai has that poker face somber look of a man with it all under control. And finally, the word "blue" starts with B, which is the second letter of the alphabet, and ends with E, which just happens to be the fifth letter of the alphabet. The front of the fez is decorated with symbols of the Order. The initials F.O.M. appear above the crest. The F.O.M. crest is a blue moai which evokes the famous Kahiki Supper Club fireplace, this and the imprint MMV marks the founding of the Order in Columbus, Ohio, in 2005. The blue moai protects a lit flame to remind us that landmarks like the Kahiki may be gone but the spirit lives on. Below the logo appears the word Honui. A few may have additional decoration or symbols on it that apply to the wearer. Finally the fez is topped with a black tassel. Many colors were discussed: orange, red, a complimentary blue perhaps? But then we discovered the extra long tassel. This was no mere tassel, it was two feet long. Everyone knew right then that we needed the extra long version. Why do you need a 24" tassel you say? What is the advantage? That's easy: it looks fantastic. There are limited color choices in tassels that long and for a blue fez that left black and while tassels on the table. While we all love Navy Grog the navy blue and white was a bit too nautical looking. On the other hand, navy blue and black looks sharp and matches that stoic, calm moai figure very well. And that is why the Honui Moai wear a blue fez.